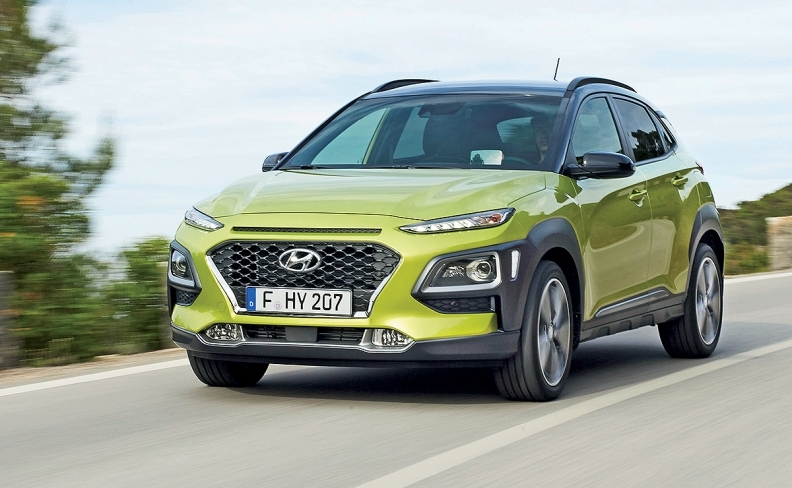 Hyundai hopes new models such as the Kona will boost sales. SEOUL -- Hyundai Motor posted its smallest quarterly net profit in five years and warned the second half would be challenging as political headwinds hit sales in China and slow U.S. demand continues. The South Korean company -- which together with affiliate Kia Motors is the world's No.5 automaker -- has been betting earnings will recover gradually, but its plans have ground to a halt with China's backlash over Seoul's decision to deploy an anti-missile system, the U.S. Terminal High Altitude Area Defense, showing no signs of abating. Slower demand in the United States, the automaker's No.2 market after China, has also been taking a toll, a trend the South Korean firm cautioned will persist through the rest of the year with its mainstay Sonata sedan losing ground in a market powered by crossovers and SUVs. "The challenging business environment is expected to persist in the second half because of negative external factors such as a slowdown in U.S. demand and China's THAAD issue," Hyundai CFO Choi Byung-chul said on an earnings conference call. Hyundai Motor said second-quarter net profit halved from a year ago to $729.14 million (817 billion won) -- its 14th straight year-over-year decline and the smallest since the first quarter of 2012. Analysts on average had expected 1.35 trillion won. Operating profit came in at 1.34 trillion won and sales at 24.31 trillion won for the period. The company is aiming to shore up its global sales through new models such as the Kona subcompact crossover and Genesis G70 sports sedan, the CFO said at the briefing. Its weak brand image has also put Hyundai at a disadvantage versus local and global rivals such as Honda Motor Co., Toyota Motor Corp. and General Motors, which all saw higher China sales last month. GM, in its earnings call on Tuesday, said it set a second-quarter sales record in China. In the United States, Hyundai Motor's sales from January-June fell 7.4 percent, the second biggest drop after affiliate Kia Motors. The slump came despite the automaker sharply boosting incentives to buoy sales. It is set to face more pressure as competition rises in the United States, where Asian rivals such as Honda and Toyota will be launching redesigned midsize sedans this month, going up against the freshened Sonata to be offered by Hyundai Motor even as sedan sales weaken worldwide.